There was an invigorating buzz in the air. It carried us with momentum and comforted us with familiarity. A safe space, a family reunion, a genesis and a continuum. 1200 people from across the country had gathered at the J.W. Marriott at LA Live for the 12th annual ADCOLOR Conference and Awards. At a Japanese restaurant next to the hotel, six of us gathered to put the finishing touches on what would be a glorious night of connections, conversations, and commitments. Flashback to a few months ago in Lower East Side, NYC. Stephen Kim, former Microsoft and Verizon VP, Unsung Hero 2017 honoree, and who we call the “godfather” of what has unofficially been coined the “Asian Mafia” had a simple but powerful idea: let’s connect the Asians of the ADCOLOR community together. He shared his idea with the equally brilliant Susie Nam, COO of Droga5 and fellow ADCOLOR board member, and there kicked off the beginning of a mini movement. Over the course of a few weeks, the group turned to 3, then 4, then 5, then 6. Then, with the help of the ADCOLOR team, we had an agenda. 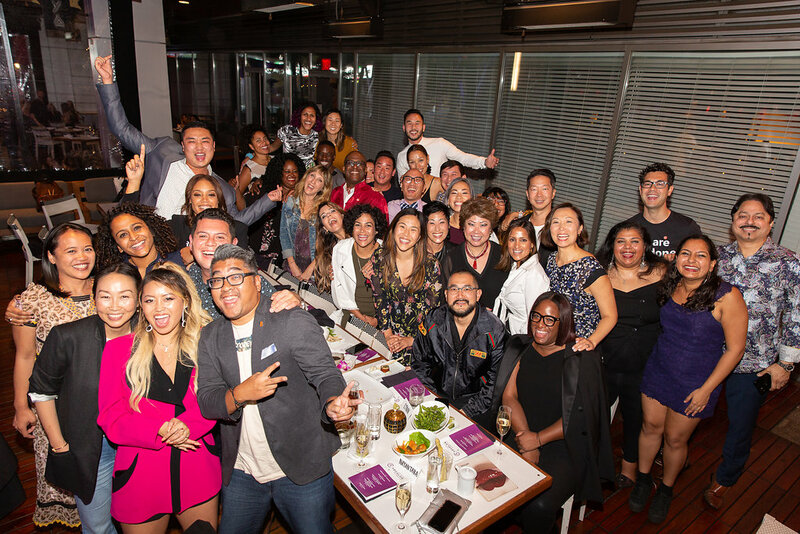 A dinner and discussion at ADCOLOR, gathering power players and influencers in the media industries. An inaugural gathering of Asian Americans and allies, to galvanize a community to help further create authentic representation in the creative industries. So here we were, after months of meetings, conference calls, and a last minute fire drill that involved Stephen Kim driving to two different AV equipment stores across town in search of an amp and mic to set up at our reserved area of the Katsuya patio. Guests arrived, champagne flowing in hand, feeling like a humbler, smaller, lower budget version of Crazy Rich Asians. Introductions were made, toasts were given, and connections were sparked. Susie Nam opened us up by sharing her moment of truth, setting an honest, welcoming tone that filled the space for the rest of the evening. Next on the agenda was a conversation between me, a young writer at Anomaly, and David Lee, a seasoned (and also young) Chief Creative Officer at Squarespace. I opened with the acknowledgement that as our first gathering, we could cover a range of topics relating to the Asian American experience: the emasculation of Asian men, the hyper sexualization of Asian women, the model minority myth, the historical whitewashing of Asians in Hollywood and the current state of representation in media. But we were there first and foremost to get to know one another. As people who work in advertising, marketing, tech, entertainment, sports, we were there to share our stories with each other, knowing there’s always a unifying thread between the diaspora of Asian experiences. In our conversation, David Lee and I talked about our upbringings and how our environment shaped our identity. His as a Korean Canadian and mine as a Korean American growing up in the South. We shared stories about our parents, how they’ve responded to our creative careers, and ended with the advice we’d give to our younger selves. David’s advice? Embrace the uncomfortable. Discomfort leads to growth, and we aren’t able to grow unless we continuously strive to change our environment. My advice? Despite what most Asian parents preach, don’t be afraid to break the rules. Following the rules will get you ahead, but it won’t get you far. Stephen Kim, with his infectious energy and genuine enthusiasm to make the world a better place, closed us out with a request: don’t let the conversations end here. He asked us to commit to following up with at least one other person from tonight. He ensured us we have the power to create a community. As the dinner stretched into the late hours of Saturday evening, the champagne continued to pour as conversations about hometowns, work lives, and career paths continued to pour into the night. Asians across the full diaspora, Asians who have often felt invisible in the conversations around diversity and inclusion, Asians who have defined their own ways of being American. This was our moment of truth, our moment of solidarity with the ADCOLOR movement. On behalf of the host committee, we’re looking forward to creating more momentum and more connections ahead. Cheers to building the road ahead! Stephen Kim and Susie Nam, our fearless leaders who led the charge, two Asian Americans who embrace their identity and pave the paths necessary for people to follow suit. Rebecca Chin, our organizer extraordinaire who sent google doc after email after text to ensure we were meeting deadlines, keeping all the pieces in place, and driving the ship forward in the right direction. Leo Wong and Kevin Lee, crucial members of the ADCOLOR community who always step in to keep things moving, from handling venue and vendor contracts to printing materials to overseeing the making of name cards. It’s in the details! Tiffany R. Warren and Christena J. Pyle, who understood the importance of this gathering, stepped in when needed and stepped back when warranted. Because of them, we’re able to call ADCOLOR a part of our family. Lisa Lee, for supporting our vision and backing us up with funds, resources, and ideas that helped elevate the night into the incredible gathering that it became. David Lee, for sharing your story with a roomful of new friends and showing us that there’s always something to learn from each other. Adu Adu and Natalie Kim, for making sure the night had visibility on ADCOLOR’s social channels.